That is what Nike's engineers have decided when it comes to their successful range of Method putters. Featuring the company's Polymetal Groove technology, the Method line has been on Tour and in shops since 2008. Players such as Tiger Woods, Rory McIroy and Paul Casey have enjoyed success with Method putters. For the 2014 season Nike have taken four classic head designs and given them a modern makeover, creating the Method MOD range. Each of the four MOD, or "Modern Classic", models features a new arc design profile, red detailing, a satin chrome finish and of course, Nike's Polymetal Grooves. As with any grooves on a putter face, Nike's grooves are designed to lift the ball out of its resting place and en route to the hole with a smooth, consistent, skid-free roll. Nike say that it take's a ball 0.0005 seconds to leave the spot at which it rests. Ensuring it leaves this spot in a way that maximises its chances to go in the hole, is crucial. Nike's Polymetal grooves are designed to offer this faster, forward roll. Once the putter head is created, Nike cut into the area behind the face, via a slot in the sole (visible in the photo above). A soft, polymer material is then injected into the cut seeping out of the face grooves. The polymer is then removed from the lower-half of each groove, leaving the exposed metal. 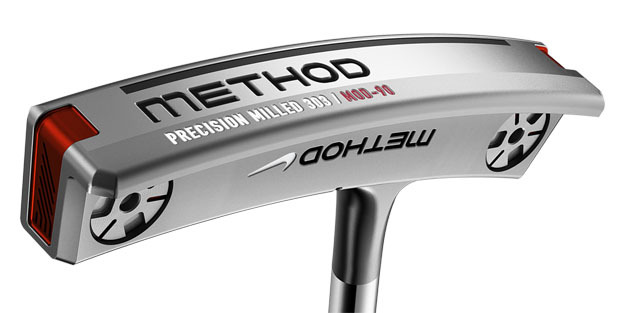 As well as a truer roll, Nike have worked to make the new Method MOD range more forgiving. Much like a driver or iron, the key is to arrange weight in the clubhead in such a way that off centre strikes receive more forgiveness. By cutting through the sole of the Method MOD putters, Nike were able to save weight. This discretionary weight is then added back to the toe and heel areas of the putters using weight screws, creating a lower, deep centre of gravity. Furthermore, each of the four heads is weighted and balanced specifically to ensure the correct feel, forgiveness and weight to benefit a range of golfers. The name of each model relates to the degrees of toe hang the putter has. The mallet-shaped MOD 00 model has no toe hang, meaning it is entirely face balanced, suited to a straight-back-straight-through stroke. 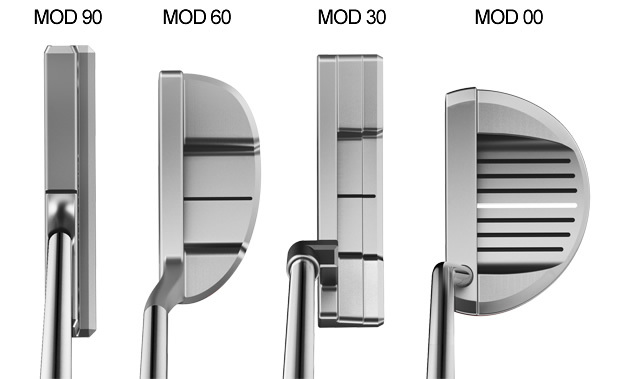 Meanwhile, the MOD 30 has 30-degrees of hang, MOD 60 has 60-degrees and the thin, blade-style MOD 90 has a full 90-degrees of toe hang. All four models are available in either 34 or 35-inch lengths. Is there Method in Nike's madness? We found out.